We are heavy in strawberry season around here which means Saturday trips to the local Farmer's Market are a special treat. 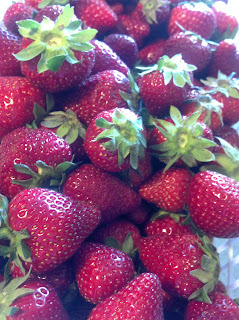 The best strawberries we have ever found are at a booth run by Putnam Family Farms from Kinston, NC. They also sell tons of other fruits and veggies (at the market & pick-your-own on their farm), as well as run a local CSA. Finding growers who sell fruits and veggies without using chemical sprays and other nasty things are such a rare find!! So glad to have met these people and we will continue to seek them out when we visit the farmers market in the future.